You are here: Home / potato chips / Who Invented The Potato Chip? Who Invented The Potato Chip? Though National Potato Chip Day is celebrated in March, it’s hard to separate the creation of the potato chip from Black History Month. If it weren’t for a notorious chef of African American and Native American ancestry, we may not be enjoying this crunchy snack nor the legend that comes with it. If you’re unaware of the legend of the potato chip’s creation, it starts in the mid-1800’s in Saratoga Springs, New York. A wealthy customer was dining at Moon’s Lake House and ordered French-fried potatoes. When the batch came out, the customer, often credited as being well-known rich guy Cornelius Vanderbilt, sent them back. The diner wanted the potatoes cut as thin as the French do for their fries (hence the word “french fries”). After the French fries were sent back a couple of times for being too soggy and under-salted, the frustrated chef sliced the potatoes as thin as possible, fried them until they were crisp and sent them out. This delighted the customer – as well as the owner of the dinner house – and the rest is history. To this date, the legend remains that George Crum was the chef who created the potato chip, a snack that would go on to create the cultivation of chipping potatoes and spawn a world-wide snacking sensation. Like most things in life, the truth is harder to pin down than the myth. What is true is that George “Crum” Speck did fry up wafer thin potatoes and serve them to customers at Moon’s Lake House in 1853. What’s in question is the events of this story and who really should be credited with inventing the potato chip. Did George Crum invent the potato chip? That’s tough to say, as there was a recipe to something similar to potato chips in William Kitchiner’s 1822 edition of his best-selling cookbook “The Cook’s Oracle”. Plus, the story of how the potato chip came about trying to please Cornelius Vanderbilt was actually part of a 1973 ad campaign from the St Regis Paper Company, who manufactured the packaging for Saratoga Chips – the potato crisps that went on to be the snack we love. What we do know is true is that George Crum was a well-respected hunter, guide and chef in the Adirondacks who’s heritage was a mix of local Native American (Oneida, Stockbridge or Mohawk tribes) and mulatto. Though his skill as a hunter was likely sought after by the wealthy New York sportsmen of the day, his skills in the kitchen are what made him famous. The wealthy and well-to-do alike would wait hours to eat meals prepared by the chef – including Cornelius Vanderbilt. From what the historians say, he didn’t give the wealthy any better service than anyone else, and that his service was impeccable. At Cary Moon’s Lake House, he cooked with his sister, Catherine “Aunt Kate” Wicks. Eventually the man’s reputation as a masterful chef gave him the ability to open his own restaurant simply called “Crums” by 1860. Though his was still in the Saratoga Springs area, the prices were the same as restaurants in Manhattan – and people were willing to wait in line to eat his cuisine and snack on the baskets of potato chips on the tables in his establishment. But does that prove he didn’t invent the potato chip as we know it? This is where it gets interesting. Crum likely had something to do with the popularity of Saratoga Chips, though in his 1893 biography he isn’t credited with inventing them and in his obituary he isn’t mentioned as the creator of the potato chip. That honor, actually, is claimed for his sister, Kate Wicks. In her obituary, she is credited with accidentally creating potato chips. In this version of the story, she was peeling potatoes while frying up a batch of crullers and a piece of peeled potato dropped into the hot oil. She pulled it out and her brother tried it. The result? George liked it, said they’d make more of those and Kate Wicks created the potato chip as we know it! So, Aunt Kate invented potato chips, right? Maybe. In his deeply researched blog about Saratoga Springs’ connection to the potato chip, Dave Mitchell digs deep into the origins of the potato chip creation myth, the history of Saratoga Springs and the people who lived there around the time of the crisp was invented. What he finds and reports only leads to more questions about who actually invented them. For example, other dining houses around Saratoga Lake produced their version of the potato chip, including George Crum’s wildly popular restaurant. Mitchell also found a reference to “Eliza, the cook”, who’s mentioned in a 1849 newspaper article for having a reputation for “crisping potatoes”. Unfortunately due to the times and how people of color were treated by the public and census, all we know about “Eliza the Cook” is that she was a black woman that worked in a restaurant in the area that considered the birthplace of the modern potato chip. Her last name or any other details about her are lost to history, save the few anecdotal mentions found by historians such Mr. Mitchell and the source he quotes, TJ Stiles. Regardless of who is credited with creating them, one thing is certain – the potato chip is a part of African American history. Whether it was “Eliza the Cook”, George Crum or Kate Wicks, all three of them are tied to the development and popularity of the salty snack. Though the potato chip as we enjoy it today was likely invented by an African American woman and not Crum, he shouldn’t be disregarded for his part in history. George Crum was obviously a remarkable man. Even if he didn’t invent the potato chip as we’re told he did, he was a black man with Native American heritage in pre-Civil War United States was able to develop his own reputation as a chef and build an incredibly successful business. Keep in mind, in 1830 the census still counted 75 slaves in New York though the Gradual Emancipation Act was passed in 1799. By the time the Civil War broke out in 1861, Crum had already opened his own restaurant. Whether or not he invented potato chips, his story is worth learning. The most unfortunate detail of the history of the potato chip is that because of the times and how people of color and women were treated, their creator never received her due credit and still doesn’t. As incredible as George “Crum” Speck was and as fascinating as his story is, Kate Wicks and Eliza the Cook’s stories and participation in the creation of the crisp is largely forgotten even today. There are few details about either woman, and popular history still tells the story of George Crum’s attempt to appease a cranky customer. Obviously, we think as you read more biographies about remarkable African Americans during Black History Month the appropriate snack is the potato chip. 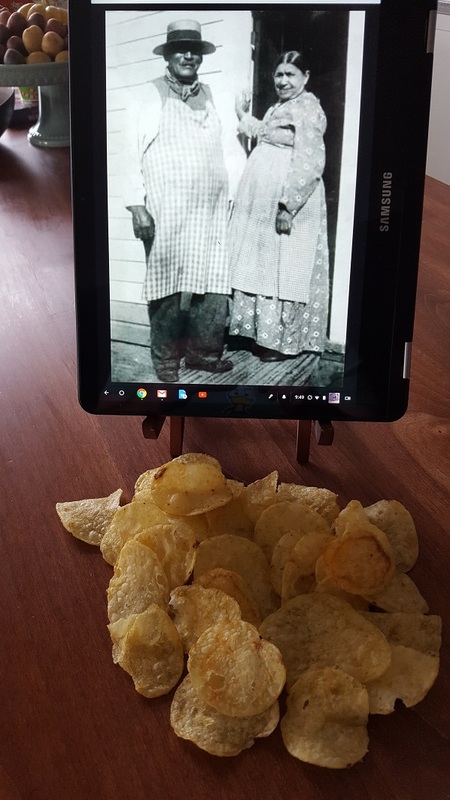 Even if history later finds that the crisp is much older than the mid-1800s, Katie Wicks and George Crum are still an important part of potato chip history and a part of chips’ popularity. Before we wrap this up, if you’re at all interested in learning more about George “Crum” Speck, Katie Wicks and Saratoga Springs’ relationship to the potato chip, we strongly encourage you to check out Dave Mitchell’s blog, “Chips, Crums and Specks of Saratoga County History”. Mitchell does an excellent job of not only researching Saratoga Springs’ tie to potato chips, but also gets into society and race relations in pre-Civil War New York. It’s an incredibly fascinating read and tells the story of remarkable people.